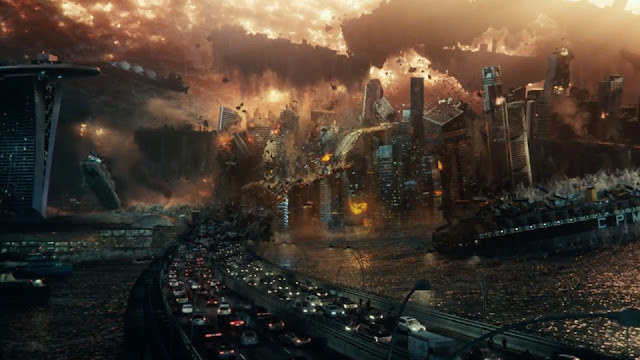 When Independence Day came out in the mid nineties everyone was blown away by the spectacle on offer, it ushered in the age of world wide apocalyptic films. It was cheesy as hell and very jingoistic but still pretty good dumb fun. Now in 2016 can Independence Day: Resurgence reach the same heights? 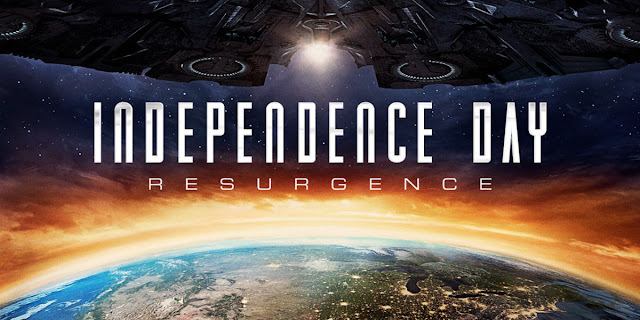 Resurgence takes place twenty years after the end of the first film, during that time humans have reverse engineered alien technology which has brought with it a new golden age where the whole world are united as one (and also seemingly used the technology to perfectly recreate all the decimated cities). However now a new threat has arrived, answering a distress signal from the ruined fleet, this new one is a mothership 3,000 miles wide and one which swiftly and effortlessly wipes out Earth's new defences. With the ship committed to finishing what the advance party of twenty years back could not do is it finally curtains for humanity? Back in the day special effects were enough to wow people, but now that just isn't enough. There are scenes of tremendous devastation and it all looks amazing but it doesn't feel as wide spread this time around. We see an Asian city as well as London utterly destroyed, but aside from that everything else seems left alone. For a globe spanning film there is a surprisingly limited amount of locations with much of the film taking place at Area 51, a few other places feature but it all seems quite limited in scope. Will Smith's Captain Steven Hiller was responsible for a lot of the charm of the first film, here there is just no one to take his place, whole squadrons of fresh faced soldiers are introduced, but none of them are ever anything more than irritating. You have Hiller's son Dylan (Jessie T. Usher) set up as the hero but he is a complete personality vacuum. You have the stereotypical rebel pilot, here played by Jake Morrison (Liam Hemsworth) doing his best Nathan Fillion impression, and you have no less than four different comedy characters, one for each of the different plots going on. In films even one comedy character is usually too much, but returning Dr Brackish Okun (Brent Spiner) who awakes from a coma he has been in since the first film is the only effective one here. The comedy clumsy pilot is lame, comedy cowardly government official who follows David Levinson (Jeff Goldblum) is even lamer, and Levinson's Dad Julius (Judd Hirsch) is ruined due to being relegated to an utterly pointless and unneeded sub plot that should have been left on the cutting room floor. There are quite a few returning actors from the original, along with Goldblum, Spiner, and Hirsch you have four others that include the legend Bill Pullman as the ex President now suffering some kind of an alien Alzheimer type debilitating disease. It is telling these older actors are all so much better than the ensemble of irritating young adults who spend most the screen time in close up reaction shots where it seems their stage direction was to 'convey all emotions at once'. The plot first time around was not anything special, here it seems even more basic, the aliens coming not for revenge seemingly but just to carry on their predecessors work. There is some spice in the form of a benevolent alien (seemingly The Traveller from the Destiny video game), and a later twist that sees Resurgence become Cloverfield briefly (as in giant monster, not shaky camera footage) in a very entertaining sequence. The aliens all look pretty cool but not as potent a threat, effects are not bad at all, they feature out of their ships more than the first one but still mostly confined to impressive looking but ultimately dull dog fights which seem all too brief (the majority of Earth's fighter pilots are killed off screen it seemed like). There are a huge tangle of plot holes, it all seems fine and stupid but as soon as you stop to analyse anything it all falls apart. I had a ten minute discussion about all the plot holes with a guy at my work, it really is an inexhaustible topic. 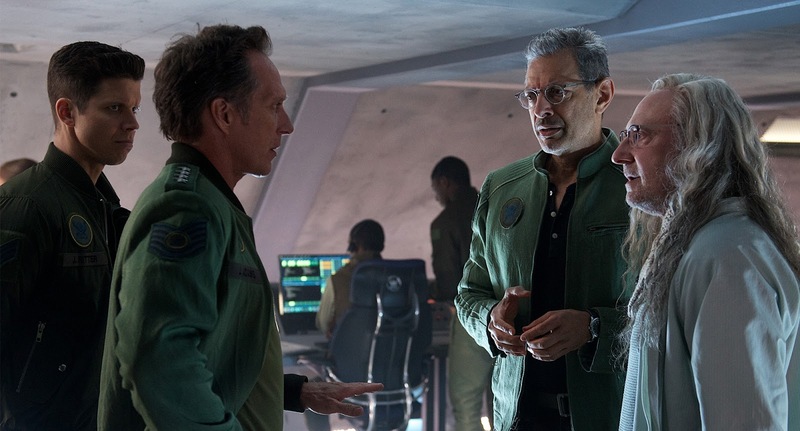 Independence Day was better than it should have been due to a strong cast of experienced actors, here the young cast are all so forgettable that you just do not care about anyone. Despite all the spectacle on offer I soon began to get bored, this is more dumb fun, neutered to the lowest common denominator, and as such even with my brain shut off I still glanced at my phone a few times to see how much film was left. This just didn't excite as much as the first film, I love how they tied these two together, I loved getting some of the original cast back for more, and it is a very beautiful film with some stunning effects. For me this just wasn't memorable, featuring as it does after an initial fun start a nonsensical plot, and an ending that screams sequel but for which I couldn't muster up the energy to even whisper that word.